While agglomerations along the Rhine are confronted with the uncertainties of an increasing flood risk due to climate change, different programs are claiming urban river front sites. Simultaneously, urban development, flood management, as well as navigation and environmental protection are negotiating the border between the river and the urban realm. This produces complex spatial constellations between the river system and the urban realm with a diverse set of interdependencies, where programs have to synergize while adapting to dynamic water levels. 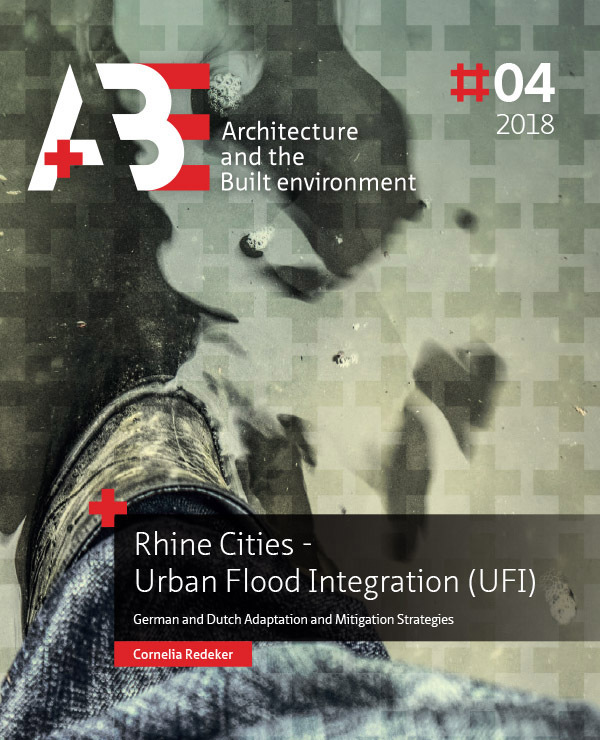 Based on an expanding area at risk and the reliance on flood levels to remain within an acceptable spectrum for adaptive measures to be effective, Urban Flood Integration (UFI) involves border negotiations between the river and the urban realm where adaptation and mitigation ideally synergize. Instead of a scientific approach that reduces complexity in order to reach a verifiable question, a post-normal science approach is chosen as an evaluation and working method applied within this research. The working method relies on literature studies, semi-structured interviews and empirical research through repeated site visits. The general heterogeneity of the case studies regarding their planning structure, status and time scales, data availability and the willingness by the agencies involved to provide usable information shapes the formal research structure. Anthropogenic transformations of the Rhine flood plains in the 19th and 20th century have turned formerly wide, often meandering or bifurcating river beds into urbanized embankments along straight, channelled rivers. The perception of the river changed from being dynamic to being controllable. This produced the spatial backdrop for modernist and therefore sectoral developments based on a dialectical relationship between the urban realm and the (river) landscape. Yet, as conversions of former harbours are turning sites outside the flood defence into inner city living quarters, as retention polders are positioned in flood plains with enough damage potential to threaten regional economies, and flood mitigating measures are more viable/effective on site in the middle of the city than in a rural area, site specific negotiations between simultaneous programmatic claims are producing new urban typologies/ecologies that in turn demand and rely on a new methodological approach. Within this research design is considered not only a spatial, but also a strategic tool capable of not only linking different programs, but also different disciplines. Flood Risk Management along the Rhine today combines river expanding measures and adaptive strategies with the existing defensive system to cope with the risk increase as a consequence of previous interventions and developments and fluctuations in water levels due to climate change. Differences in landscapes and urgencies and differences in planning cultures between the Upper and Lower Rhine and the Delta have also led to different strategic approaches. Within this research the innovative capacity of the adaptive and anticipatory water-based approach in the Netherlands provides lessons to be learned specifically regarding spatial quality as a strategic component of water-related projects. In summary, differences in landscape, threat and political structures have produced different planning cultures in Germany and the Netherlands in terms of flood management. Both Dutch and German mitigation measures remain path dependent on the defensive system. Yet, whereas the Dutch approach to flood mitigation is holistic in an extended ecological sense and specifically includes spatial quality, in Germany, planning flood-related issues remains part of a sectoral approach where spatial quality is not initially included, bit remains an additional layer towards the end of the project. Confronted with a strong ecological lobby, the focus is to restore the former alluvial forest in niches. Of the six programs defined in the ICPR Atlas, forestry seems the only one capable of taking on river dynamics and transforming accordingly over time. All other programs (settlements, industries, traffic infrastructure, and to some degree agriculture, specifically when ecological flooding is taken into account) remain reliant on defensive measures, and in case of their failure, infrastructural support and adaptation measures. They are, however, not included in a design strategy that explores potentialities. In the light of long-term strategies and programs, the Dutch approach offers a more iterative planning practice that is capable of evolving with the experience gained. Dutch experience and corresponding policy adaptation has further shown that a more permissive planning approach to allow additional programs within Room for the River measures can raise local acceptance and thus reduce negative effects. In Germany, water management agencies avoid projects that could become precedence cases and thus enable repetition. This restrictive approach is a hindrance on the way to larger-scale strategies that rely on pilot projects as testing grounds. The Dutch approach seems to aim for incentives and actually provides them, as the trade-off in the Nijmegen case shows. Moving from a restrictive to a responsive planning approach that includes incentives produces a breeding ground and should always be a central component of any strategy. One of the main findings of this research is, specifically in Germany, the limited availability of information, as well as lacking visualization layers of ongoing programs and projects (which may be an additional indication of the lacking involvement of designers in German spatial flood risk management projects). This research contributes to a broader understanding by providing an atlas of selected flood-adaptation and flood-mitigation typologies along the Rhine between Basel and Rotterdam. -applying back-casting strategies to move beyond existing conceptions: design may thus becomes “telescopic” and allow a challenge of existing givens, the visualization of concepts again playing a central role. -Development of Design Guidelines for a river segments approach: Evaluation of ongoing or recent mitigation and adaptation projects, but also other river-related developments (e.g. navigation) in an academic research project to define potential emergent capacities between systemic and qualitative elements. In collaboration with the practice, smaller scale pilots as part of existing mitigation programs on a river segment scale could aim to substantiate the findings. -Cost-Benefit-Analysis Spatial Quality: To substantiate the qualitatively developed argument towards Urban Flood Integration (UFI), a cost-benefit analysis of a transdisciplinary layer that is comparable to the measures defined by the Dutch Quality Team for the German Room for the River, which focus today on ecological rejuvenation vs. spatial quality as a secondary aim. The final outcome of the following multiple case-study investigation and the typological atlas provided is seen to be valuable for a number of different organizations, such as governmental and educational institutions dealing with the geospecific context and spatial development along the Rhine, representatives from the building sector and venture capitalists, as well as people with a personal interest in ecological urbanism in the context of the Rhine.